Have I got a great new soup recipe for you. If you LOVE Italian Wedding Soup as much as we do, you’re going to adore this Lemon, Tortellini & Meatball Soup. After enjoying Greek Whole Roasted Chicken seasoned with lemon, garlic & oregano it seemed only fitting to turn the yummy homemade chicken broth infused with those flavors into a Greek inspired soup aka Lemon, Tortellini & Meatball Soup. This recipe builds in plenty of flavor infusion so don’t worry if you’re starting with plain chicken broth, the soup will be absolutely delicious. To begin, make up a batch of chicken meatballs, seasoned with lemon zest, fresh rosemary and dried oregano. Brown these off in batches in a Dutch oven, then reserve them to finish cooking in your glorious broth. 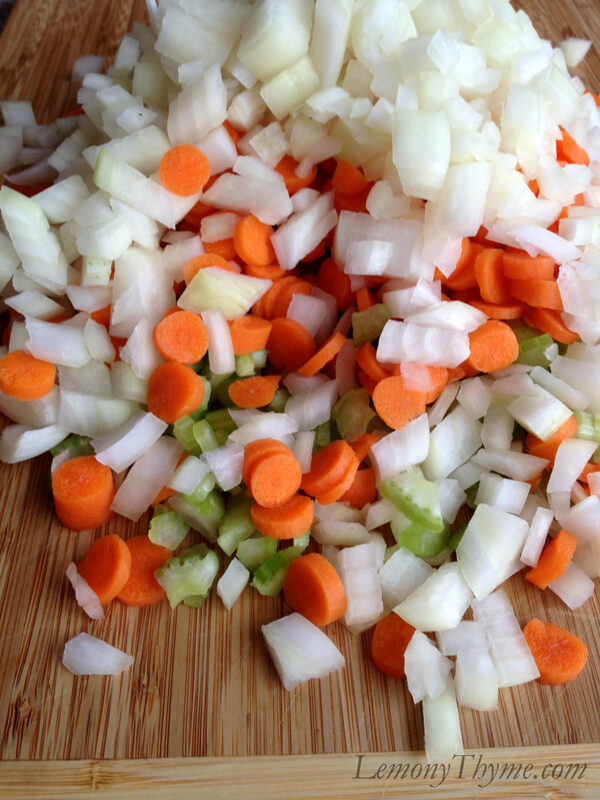 As with many of our favorite soup recipes, a classic mirepoix is a wonderful place to begin. Once sautéed and tender, the broth is added along with additional seasonings, including fresh lemon juice and zest. Just like a squeeze of fresh lime juice gives Mexican Chicken Soup it’s signature flavor, fresh lemon juice is paramount in this Lemon, Tortellini & Meatball Soup. About 10 minutes before you are ready to serve, add the tortellini and meatballs to the pot and allow to simmer until cooked through. For the best results, add the fresh spinach leaves just before serving along with a sprinkle of freshly grated Parmesan cheese and flat leaf parsley. I shared Lemon, Tortellini & Meatball Soup today at lunch and my taste-testers gave the Mmmm Mmmm Good stamp of approval! Tip: If you are not going to eat all the soup at the first sitting, I recommend only adding enough tortellini for the portions you need. OR do as I did, which was to add it all, but then remove the extra tortellini with a slotted spoon to refrigerate in a separate container. This kept them from sucking up all the good broth and turning into mush. I added them back into the soup pot when reheated for lunch. Worked great. Combine meatball ingredients. Shape into 1-inch balls (about 3 dozen). In a Dutch oven over medium heat, sauté meatballs in 1 Tbl. olive oil in batches until browned. Remove using a slotted spoon and reserve. Add 1 Tbl. olive oil, onion, celery and carrots to Dutch oven and sauté over medium-high heat for 5-6 minutes until tender or choose a low and slow method and sauté them over medium-low heat, covered for 15 minutes. Add in garlic and stir another minute. Stir in broth, lemon juice, 2 tsp. lemon zest, 1 tsp. fresh rosemary (or ½ tsp. dried), oregano, salt & pepper. Bring to a boil, stirring occasionally. Add tortellini and reserved meatballs. Reduce heat to medium; simmer, stirring occasionally, 8-10 minutes or until pasta is tender. Just before serving add the fresh spinach leaves. Garnish with freshly grated Parmesan cheese and parsley. Can you believe that until last night, I had never had soup with meatballs in it?! I was already making chicken soup to nurse a sore throat when I saw your post. It couldn’t have been more perfect timing, since I had just realized that I had no chicken on hand! (I know, who starts making chicken soup and forgets the chicken?! :P I blame my cold.) I did, however, have pre-cooked frozen turkey meatballs on hand from another day. I decided to give the meatballs a try, and it was amazing!! I’m really looking forward to trying your Lemon, Tortellini, and Meatball Soup next, and then your Italian Wedding Soup :) I have a feeling meatballs are going to be making their way into many of my future soups! That is AWESOME. These are the kind of comments that make me so happy. I must admit I had a similar revelation the first time I experienced Italian Wedding Soup. Love the meatballs!! Thanks so much for sharing Alyssa.